Without having to drill holes into trees, these hammock tree straps will have you relaxing safely in no time. The set up involves wrapping the straps around a tree & then inserting the S-hooks into the tear-drop end on your hammock. 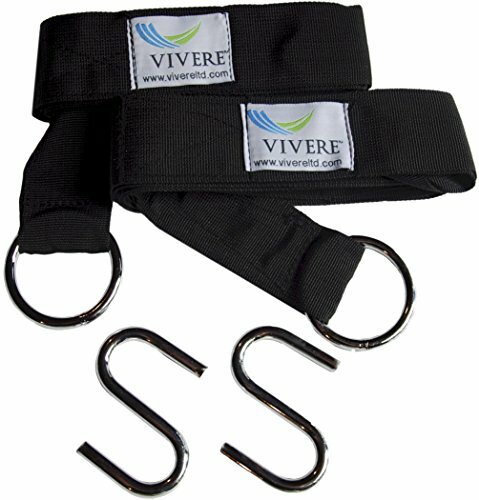 These straps come wrapped in a Pack of two, & each strap is 10' long; this means they will be able to wrap around any size tree & help position your hammock to the height that’s best for you. The straps are made of heavy-duty, weather resistant nylon, & the package comes with all the hardware required for any style of hammock. These hammock tree straps are best used with Brazilian, parachute, & spreader bar hammocks, as well as the Brazilian hammock chair. Includes two 10ft long straps, two O-rings, and two S-hooks. Both straps are made of heavy-duty, weather resistant nylon. Each strap is 10ft long, so you can adjust your hammock to your optimal hanging Height. You can move your hammock easily without having to drill holes into trees for support. Can hold up to 450lbs capacity. If you have any questions about this product by Vivere, contact us by completing and submitting the form below. If you are looking for a specif part number, please include it with your message.